The biceps tenodesis is a minimally invasive arthroscopic surgery that is usually performed to treat biceps tendonitis, a condition that indicates a partial or complete tear of the biceps tendons within the shoulder. The biceps tendons play a crucial role in moving the arm and flexing the elbow. Therefore, when the biceps tendons are detached from the shoulder joint, the shoulder fails to keep the arm stable and strong. In addition, biceps tendons tears can lead to a deformity in the biceps muscle if not addressed immediately. Torn biceps tendons cause an extremely irritating pain in the shoulder which, unfortunately, Matthew Gargano had been experiencing for a long time. Prior to visiting Manhattan Orthopedic Care, Matthew had appointments with several other orthopedic doctors because of the terrible shoulder pain, but none of those appointments ended up with the right diagnosis. During his consultation with Dr. Armin Tehrany, Matthew was fascinated by Dr. Tehrany and the impeccable meticulousness he had shown while examining Matthew’s shoulder and forming a diagnosis. After he carefully examined Matthew’s shoulder, Dr. Tehrany diagnosed Matthew with a biceps tendon tear that required an immediate medical attention. 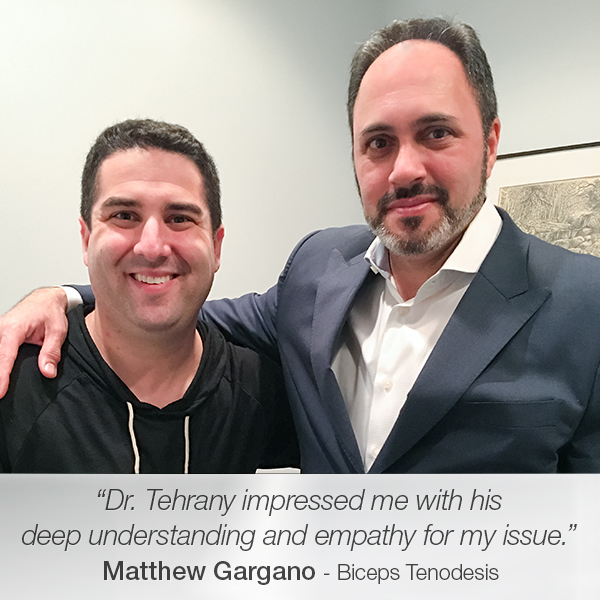 Prior to recommending the biceps tenodesis, Dr. Tehrany went through the details of the surgical process and the recovery period, helping Matthew to feel comfortable proceeding with the shoulder surgery. Excited to be pain-free after an exhaustingly long period, Matthew wrote a candid patient testimonial and expressed his gratitude to Dr. Tehrany and the whole team at Manhattan Orthopedic Care. “I had been visiting another Orthopedist for a nagging shoulder issue – and was getting nowhere. After visiting with Dr. Tehrany and finding out and going over what exactly the issue was, he impressed me with his deep understanding and empathy for my issue.